Along with six other people, Lula is accused of trying to bribe former Petrobras director Nestor Cerveró into not signing a plea bargain. SÃO PAULO, BRAZIL – The former President of Brazil, Luiz Inacio Lula da Silva, is scheduled to testify on Tuesday (March 14th) in Brasilia. The former leader is accused of trying to obstruct the Lava Jato (Carwash) investigations by trying to dissuade former Petrobras director Nestor Cerveró of signing a plea bargain. 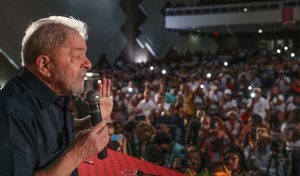 Former President Lula speaking at a conference last week, photo by Ricardo Stuckert/Instituto Lula. Lula had requested that his testimony be taken by videoconference, from São Bernardo do Campo, São Paulo, where he lives, but the request was denied. The former PT leader was accused along rancher José Carlos Bumlai, banker André Esteves, and former senator Delcídio do Amaral of trying to buy the silence of Cerveró, so that he would not implicate the officials and executives in the corruption scheme at Petrobras. In November of 2015 Amaral was arrested after a recording revealed that he had offered R$50,000 to the executive’s family for his silence and even suggested an escape plan where the former director would leave the country through Paraguay. Since this is a criminal action suit, Lula’s testimony will be opened to the public. The Military police have closed off adjacent streets to the courthouse to stop any protester (for or against) from nearing the location. A small group of pro-Lula demonstrators was at the scene to render support to the former leader but no violence was reported. In addition to this case, Lula has also been charged in two other cases of corruption and money laundering related to the mega Lava Jato investigation. Last week local media reported that the former president was starting to announce to colleague and supporters that he would be running in the 2018 presidential race. It is apparent to anyone with eyes that see, Lula has absolute contempt for the rule of law and obvious disdain for the plight of the Brazilian people. Lula is a narcissistic megalomaniac, suffering from delusions of grandeur. Lula is a danger to Brazil not a Saviour!